3 lenses per box @ $15.50 per box. Minimum order 4 boxes (six months' supply). 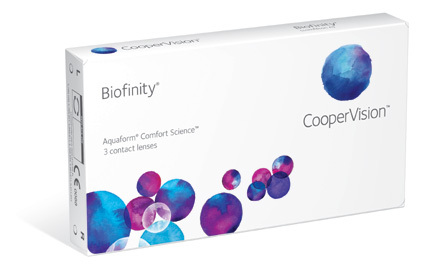 Coopervision's patented Aquaform technology gives the Biofinity resistance to both dehydration and deposits while its silicone hydrogel material allows very efficient oxygen transmission to the eye for white, healthy eyes. As well as a soft, moist lens material, each lens has a rounded edge for increased comfort as well as an aspheric front surface for crisper vision.